I am a coffee lover!! I look forward to a LARGE cup every morning before, during and after my hectic morning routine. Lately, I have been hearing so much about cold brew coffe, and I just had to try it for myself! First, I read a bunch on Pinterest about the perfect cold brew recipe. I was a little hesitant at first because it seems like a long process. However it took me less than five minutes to put everything together and begin the brewing process. 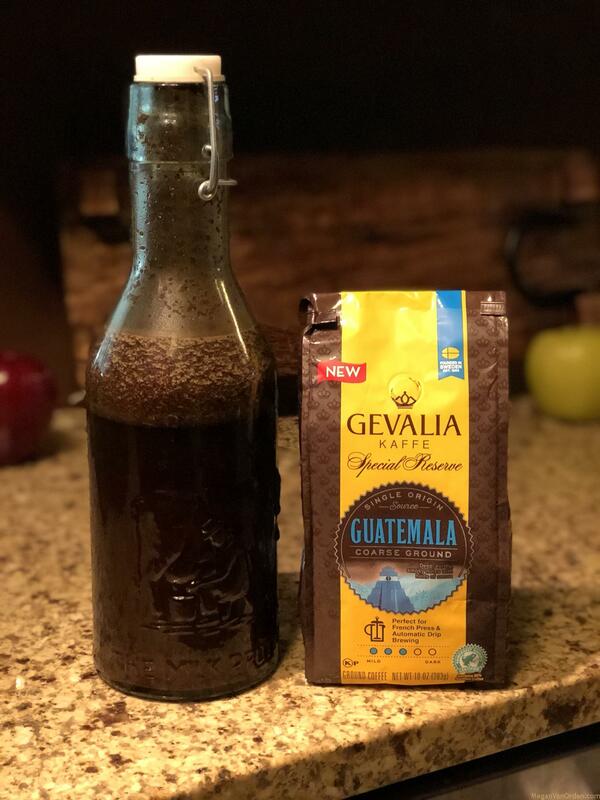 Every recipe I went through stated that filtered water and coarse ground coffee, not find ground coffee, were the two most important elements, followed closely by making sure it was in a glass, not plastic, jar. The measuring system that I used is a 3 to 1 ratio, three parts water one part coffee. My grocery store did not have many choices for coarse ground coffee, so I picked one that was a mild brew as I’m not a huge dark roast fan. You can always get whole coffee beans if you have a grinder and grind them yourself or go to a local coffee shop and have their beans coarsely ground for you. I used my Brita water filter pitcher as my filtered water source, however you could use whatever water or filter water is your preference. It’s also important in the cold bring process that your jar have a lid. I put the water in first followed by the coffee. I used the skinny end of a wooden spoon to mix.